This is a step-by-step lesson for you to experience what our Family Spanish Membership is like. Later you'll have the chance to join the Membership. Our Family Spanish Membership is designed for families with children between the ages of 2 and 8. If you have older children too, they can be in charge of teaching Spanish to you and to their younger siblings. First things first...We assume you don't know any Spanish. The cool thing is that you get to learn Spanish while you're teaching it to your children. That's right! Our lessons empower you to become an overnight success at teaching Spanish to your own children, even if you've never studied Spanish before. For this first lesson you'll teach and learn numbers 1-10 in Spanish. Let's get started! 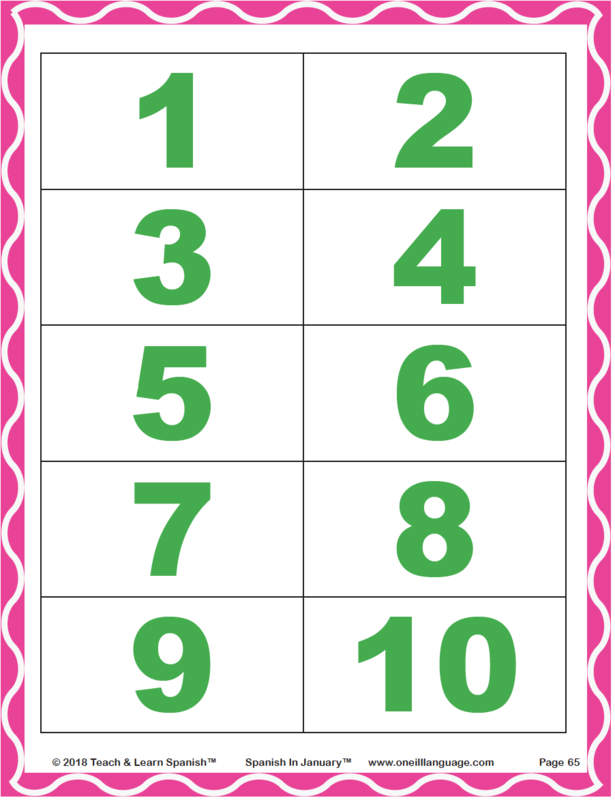 The poster of numbers 1-10. You can click on the blue button below to open the numbers poster. Print the poster so you can use if for the activities below. If you don't have a printer you can use the number poster below. The Parent Learning Video teaches you how to pronounce numbers 1-10. You want to feel confident pronouncing the numbers before teaching them to your children. As you're watching the video, look at the page to the right of the video entitled Activity 8 Vocabulary: Numbers 1-10. This page is your "cheat-sheet". See how each number is written in English followed by Spanish and there's a pronunciation key to the right of each word? Read the pronunciation key as though you're reading English and your pronunciation will be spot-on! Be sure to stress the syllables that are in bold and underlined. We try to make everything as simple as possible when it comes to families learning Spanish! After you're comfortable pronouncing numbers 1-10, watch the Parent Teaching Video which walks you through how you're going to teach numbers to your children! To play the audio file, click on the small gray triangle. Tell your children that you're going to listen to a song that pronounces numbers 1-10 in Spanish. Tell them to try their best to count out loud with you. While you're counting with the song, point to the numbers on the handout that you printed out. Repeat the audio file several times. Each time your children will count with more enthusiasm. Let them take turns pointing to the numbers on the handout as you count together. ​Try counting to ten without the song. Have your children taking turns counting to ten by themselves. Praise them in Spanish for trying! ​2. Watch the Video for Kids! Your children will love watching the video because our friend "Pollo" which means "Chicken" in Spanish counts his fingers and asks your kids to count along with him. Your children will ask probably ask to watch this silly video more than once! Make several copies of the Numbers 1-10 handout. Tape one copy on your refrigerator so you'll practice saying the numbers while you're making dinner and spending time in the kitchen together. Keep another copy on your child's bedside table and practice the numbers at bedtime. Keep another copy in your car and practicing counting while driving to and from places. If you can, laminate the copies so they will last longer! ​When carrying your child up and down the stairs (or walking with them), count the steps out loud in Spanish. I used to do this with my children when they were babies and toddlers and they learned to count to 13 (that's how many stairs are in my home) in Spanish before English! You can do this too. Just make it a habit. During story time, act excited when saying to your child, "Hey, let's count how many rabbits are on the page in Spanish!" (Or whatever pictures there are, count them together in Spanish. Each time you toss the ball back and forth, count one more number. Can you make it to 10 without the ball touching the floor? Blow up a balloon and tap it back and forth while counting one more number higher with each tap. Can you count to ten without the ballon touching the floor. If you have younger children teach them how to gently tap the balloon before playing the game. P.S. Kids LOVE this game. Tapping a balloon adds a new excitement! ​When eating Cheerios, raisins, popcorn, etc. or any countable food, count out the pieces up to ten in Spanish as you serve them to your child. Once you do this a few times, chances are good that your child will begin counting food out loud in Spanish on their own. ​ You'll be so proud that you'll probably do a happy dance when this occurs! Did You Have Fun Learning Numbers 1-10? ​Would You Like to Learn More Spanish with Your Kids? An on-line family Spanish lesson emailed to you every Friday. Lessons include videos, songs, downloadable posters, picture and word flash cards. Practical ideas on how to speak Spanish as a family using what you learn. Log in credentials to our Family Spanish Membership website where you'll have access to all of the lessons. Are You Ready to Learn More Spanish as a Family?